Voyages: Sci-fi Tension Beds and Elements has just been released. Voyages features thirty suites of music with a dark, foreboding character. This addition to SonicTremor’s dramatic tension line, puts a special emphasis on pulsating elements and electronics that are sonically crafted to complement reality, spy/espionage, drama, documentary, science fiction, thriller, and related genres. 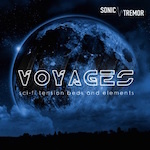 Voyages includes hundreds of alternate versions and elements, including short promo stingers, impacts, booms, mixes without drums, and ambient pad beds, allowing for full editing flexibility. Voyages is available for licensing from 5 Alarm Music. Here is a link directly to the SourceAudio listing.